Edward Judge looked forward to his morning constitutional along to the Reading Room opposite The George. It had become quite a home from home for him and his fellow village husbands who were no longer obliged to labour with their hands or their brains in order to earn their daily crust. The most uxorious of men needed to assert their independent interests outside the home (especially with all this suffragette nonsense) and it had become the agreeable custom to meet and exchange views in a place where no one would object if a fellow wanted to smoke a cigar or a pipe. With this war on, it was becoming quite an important little gathering. The general view was that it was perfectly all right to leave the management of the village to the new 1parish council, so long as one or two of them sat on it and the decisions of the council were decided in advance by the Reading Room fraternity. The problem about this, however, was brilliantly summed up by this morning’s cartoon in ‘The Daily Mirror’ (not that he would ever have such a rag in his own house – but the Reading Room had copies of most newspapers). Saloon strategists were the bane of all masculine gatherings, and simply had to be borne with gritted teeth. 1 The 1894 Local Government Act had introduced elected parish councils throughout the United Kingdom. In village terms, a constitutional change which is only 20 years old is (still) considered new. This entry was posted in The Home Front and tagged Edward Judge, Parish Council, Reading Room by layanglicana. Bookmark the permalink. Armchair strategists! Perhaps the bulk of today’s political class might be categorised as that as well. Those who’ve cut our defence to the barest bones, barely able to guard the Palace, let alone guard and defend the nation are now advocating increased military action in Iraq/Syria, which will inevitably need the PBI (Poor Bloody Infantry) to be on the ground. You can destroy from the air, you can use Armour and Artillery to decimate an enemy, but to hold ground, you need the PBI – and who took most of the casualties in both WW1/WW2, Korea, Malaya, Borneo, The Falklands, Northern Ireland, Iraq 1 & 2, and latterly Afghanistan, you can guess it, the PBI. Having done some research into WW1 losses in my parish for WW1 (143 from a parish of about 8000 in 1914) the majority of deaths were PBI. KIA being the only designator for their demise, their stories lost to the awful, horrific statistics that is WW1. 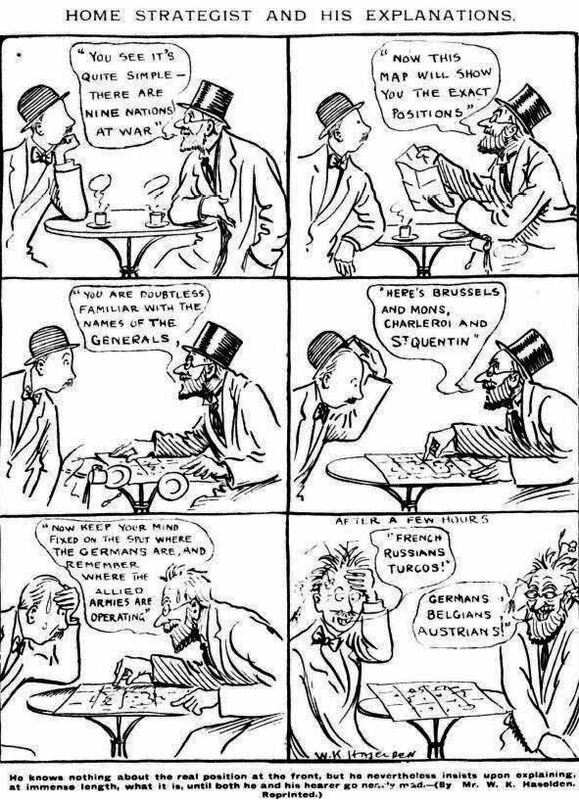 The idea that WW1 generals were incompetent and RENF’s is a myth. Most had huge experience of conventional, colonial wars, just not of a war of the size and significance of WW1 – which changed everything in military tactics. The Army Field Manual of 1906 was the bible, based on BOER war experiences. By 1914 it was out of date, later editions were much more realistic and pragmatic. It took some time for them to catch up, and they did. It’s a fact that over 100 officers of General Rank were killed in WW1 – at the front, not safe in rear areas. But tactics develop all of the time. The Army of today is fighting completely differently from the way that I was trained in the 1960’s, new equipment brings new ways of killing the enemy without even seeing them, it dehumanizes conflict and makes killers of us all. Ernie, thank-you so much for providing this valuable insight. Valuable because you know what it is like both to be an officer and to be one of the ‘other ranks’. Even in the civil service, there is nothing more depressing, as I remember well, than having to do as you were told with no one interested in your views on the subject. I also remember reaching the dizzying heights where people did not actually have to do what I said, but they did have to listen to what I had to say, and it made all the difference not just being at the receiving end. But of course the comparison falls down when you consider that I was just being told to move paper from the in tray to the out tray, whereas in WW1 your life was being put at risk by officers whose judgement you might not even trust. I am interested in comparing our figures with those of other towns and villages. Out of our population of 1200 or so, 234 are on our roll of honour. (These may not all be from our village – there are one or two who look rather like our prayer list at the back of the church, where friends and relatives seem to have been included. So say 220). Of these, 35 were killed, of whom at a quick glance 4 were officers. I think I have heard it said that proportionately more officers were killed in WW1 than WW2? It is not an area I have looked at yet, but it would be interesting to do so. But I also value your exasperation at the armchair strategists – I can imagine how annoying it must be to be on the receiving end of ‘good’ advice from people sitting comfortably at home! We always had a measure of an officer. Would I follow him up a hill in the face of the enemy? If the answer was a resounding yes!! Than, we trusted them as leaders, motivators and purely good blokes (or lasses). If we had qualms about it, than it showed that were some areas of uncertainty, which might have caused some hesitation on our part. If you think of the Falklands and the CO of 2 Para, H Jones, his blokes followed him into a volley of machine gun fire, which got himself and many others killed at Goose Green.. Lt Jim Barry was a R SIGNALS Officer from my old unit, attached to 2 Para as Signals Officer, he joined that attack and was one of those killed. H got the VC for his leadership, but it deprived his Battalion of the CO at a crucial part of the battle. Wisdom or foolhardiness or bravado? Who knows, but glorious in the tradition of the Regiment. Opinion on his actions is mixed, but the general view is that he lost control of the battle, didn’t allow his Company Commanders to exercise mission control and being too much hands on, led to his death. But the men followed him out of loyalty, trust and his perceived strengths as a power commander in battle. I admire him for his courage and leadership, but know that we’re all fallible and can make mistakes, in this case, he was too close to the battle ‘leading from the front’ which might have well have caused the battle to be lost once he was killed. Fortunately the outcome was victory for the Battalion, but at quite a high cost in lives. I remember very well when ‘H Jones’ was killed in the Falklands. I must say that from the outside, the heroism and the, I was going to say glamour, but I suppose what I mean is star quality were the outstanding features. It was very striking that while we mourned the losses of the regiment as a whole, H stood as an emblem of them all. And we all admired the brave dignity of his wife.